Long renowned for its nutmeg, cloves, and cinnamon, the “Spice Island” of the Caribbean lies at the southern end of the Lesser Antilles, not far from Venezuela. Settled by the French and later captured by the British, Grenada flaunts an eclectic Creole culture that blends African, European, and even a smidge of Latin American influence. St. George’s, the capital, wraps around one of the best natural harbors in the Caribbean. Flush with historic buildings, the old town and the waterfront retain their bygone charm. By way of contrast, the bay’s south side has morphed into an ultramodern anchorage for super yachts and jet setters. The hardworking harbor also hosts cruise ships, water taxis to Grand Anse Beach, and ferries to Carriacou and other islands. Beyond the capital, Grenada is a lush and mountainous isle with waterfalls, forest reserves, spice plantations, and sugarcane fields. 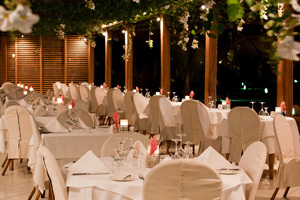 Dine al fresco at this restaurant in the Calabash Hotel. Breakfast: Le Papillion Café – Locals and visitors alike flock to this morning hangout in the Siesta Hotel on Grand Anse Beach. It opens at 7 am (except on Tuesdays), and the chalkboard menu ranges from French toast and egg sandwiches to more unusual treats like apple-ricotta fritters. Best of all, the wonderful open-air setting offers views of the pool and garden in the back. Lunch: Victory Bar and Restaurant – This red-roofed restaurant overlooks posh Port Louis Marina on the south side of St George’s Bay. Seating is indoors beneath a towering wood-beam roof or alfresco on the patio or lawn. The menu is more cosmopolitan than Caribbean, with specialties like wood-fired pizza and grilled fish, complemented by an excellent selection of wines. After lunch, take a stroll along the adjacent waterfront for a look at some of the world’s most expensive yachts. Dinner: Rhodes – British culinary master Gary Rhodes started the celebrity chef rush to the Caribbean a decade ago when he launched this self-titled gourmet eatery at Calabash Hotel on Grenada’s south side. If the romantic, open-air setting doesn’t grab you, the cuisine — a blend of local ingredients and European techniques — certainly will. Among Rhodes’ signature dishes are grilled dorado with ginger butter sauce and a passion fruit and pineapple vinaigrette; a beetroot, fig, and onion tart with soft goat cheese and red wine; and surf and turf comprising roast pork fillet medallions and seared tiger prawns. Drinks: Umbrellas – Lodged beneath its namesake parasols, this breezy beach bar lies front and center on Grand Anse Beach with views across the water to St George’s. Grab a shaded table on the roof terrace and kick back with an ice-cold Carib beer or one of the specialty cocktails. The bartenders make a mean Green Flash (rum, orange juice, and blue curacao) and Rum Woo Woo (rum, peach schnapps, and cranberry juice). Tip: With more than 5,000 students, St. George’s University on Grenada’s south shore is one of the largest schools in the Caribbean. Looking for a party? Students tend to gather on the skinny peninsula on the other side of True Blue Bay from the campus, where you’ll find a cluster of spring break-like that rock all day long. Look for Bananas, a sports bar, and Dodgy Dock, a lounge where live tunes range from cool jazz to homegrown calypso. Take a snorkeing trip to see underwater sculpturs. For Everyone: Underwater Sculpture Park – This landmark, a cluster of submerged sculptures in Moliniere Bay just north of St. George’s, is both eerie and artistic. 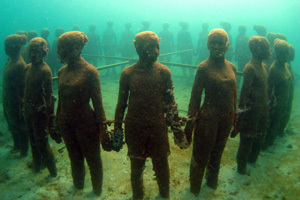 British-Guyanese artist Jason deCaires Taylor crafted the initial figures, with later contributions from Grenada’s Troy Lewis and Rene Froehlich. Many of the garden’s iconic works are now covered in coral, anemones, and other marine creatures. A number of local outfitters offer snorkel trips to the garden — including Dive Grenada — and the clear Caribbean water allows for excellent viewing, even from the surface. For Couples: River Antoine Rum Distillery – At first glance, the oldest water-powered rum factory in the Caribbean (circa 1785) may look like ruins, but it’s still making fine (and potent) libations inside its ancient gray walls. Take a guided tour around the grounds to see the distillation vats, boilers, and the18th-century waterwheel that still powers the sugarcane-crushing machinery. Finish up in the rustic, wood-floored tasting room where you can sample the final product. Some say it tastes like rocket fuel; others claim it has subtle hints of coconut, chocolate, and almonds. Either way, a visit to the factory is a trip back in time to the way rum was produced (and tasted) 200 years ago throughout the Caribbean. Guided tours are offered Monday through Friday from 9 am to 4 pm, and Saturday from 9 am to 3 pm. For Families: Around the Island Cruise – Grenada is at the southern end of the great yachting route across the Caribbean, and one of the last places in the West Indies where you can still find traditional wooden sailing craft. There are a lot of different ways for visitors to get out on the water, and a circumnavigation of the island by motorboat or catamaran is a great way to compare the contrasting scenery and vibes of the coasts. The family-oriented trips include snorkeling a coral reef and lunch on a small, deserted island with views across the water to mountainous Grenada. For the Adventurous: Seven Sisters Waterfalls – The rustic path to the falls offers a glimpse of Grenada country life and rain forest wilderness in the highlands in and around Grand Etang Forest Reserve. The first section meanders through an ancient volcanic crater filled with small farms where nutmeg, cinnamon, sugarcane, papayas, and mangoes are cultivated. The second stage leads down a steep — and often muddy — incline to the lowest of the Seven Sisters Falls, where you can swim and sun. The more daring can scramble up the cliffs and jump from the top of the highest cascade into a deep pool. The trail to the falls is not well marked; rather than strike out on your own, sign up for a guided hike with Mandoo or another local outfitter. Shop for original island clothing, fabrics, and handicrafts at Veronica’s Visions in Grand Anse. Local designer Jessie-Ann Jessamy creates clothing with nutmeg motifs that have won awards in pan-Caribbean fashion competitions. Her boutique also sells other locally made goodies, from nutmeg soap to scarves made from hand-printed custom fabrics. 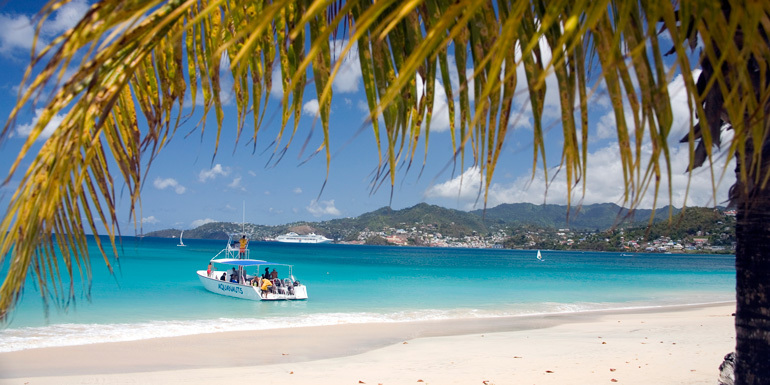 What do you like to do in Grenada?